Project Description: Send handmade winter greetings that sparkle with Grafix Funky Film. Best of all, you won’t need any adhesives! Cut a piece of card stock to 5×10 inches, then fold it in half to create a 5×5 square. Cut a snowman shape out of the Silver Sequins Funky Film. 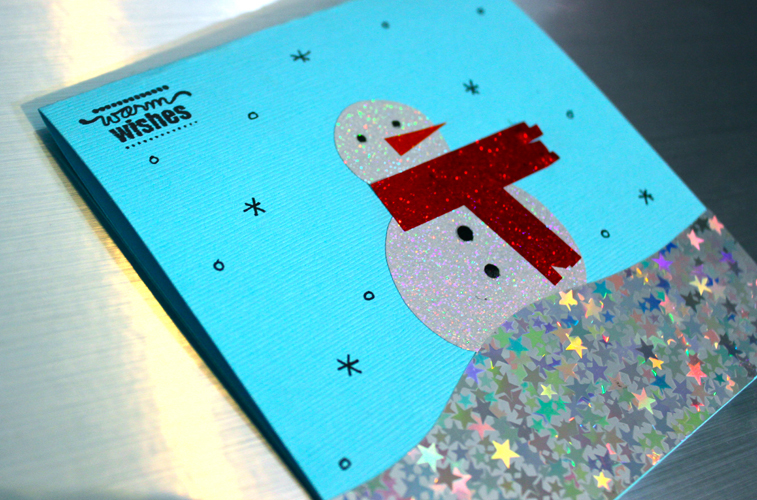 Peel off the paper backing and adhere the snowman to the center of the card. Cut a wavy strip from the Mini Silver Stars Funky Film to create a snow drift. Adhere to the bottom of the card, trimming as needed. Cut two rectangles from Cherry Red Funky Film and cut slits into one end to create fringe. Adhere to the snowman to make a scarf. Add buttons and eyes with a permanent marker. Give your snowman a carrot nose with Orange Sparkle Funky Film. Stamp or write sentiment in the upper corner. Draw snowflakes with a marker or pen.